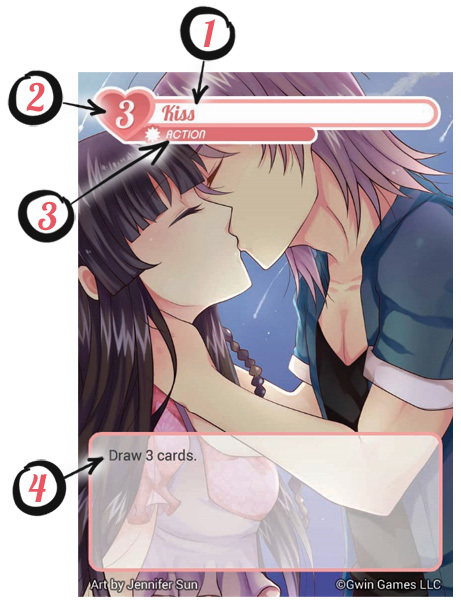 Love Formula is a card drafting game for 2 to 4 players in which you attempt to set up couples you support on their perfect date, while sabotaging the efforts of your opponents to do the same! These are the original rules. 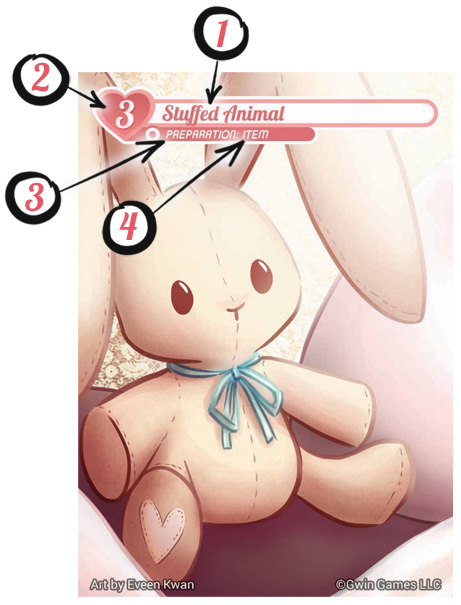 The Kickstarter campaign includes all new art, some new cards, and rules tweaks. These rules will give you a good understanding of the game mechanics and work with the print-and-play cards, but check out the Kickstarter campaign from June 27th to July 20th, 2017 for all the latest! The objective of the game is to have the most victory points when the game ends. Collect all 4 Part-time Job cards and hand each player a one of these cards. Any excess Part-time Job cards are set aside and not used. Shuffle the rest of the cards and put them in the center of the table. They form the deck. There are two phases to the game – the draft phase and the play phase. Play alternates between the two phases, with the draft phase occurring first. Once each phase has been played twice, the game ends. Each player selects a card from their hand to keep, and places it face down in a pile in front of them. When all players have selected a card, they pass the remaining cards in their hand to an adjacent player. During the first draft phase of the game, players pass cards clockwise. During the second draft phase of the game, players pass counterclockwise. If players have no cards in hand to pass, the draft phase is over. During the draft phase, players may look at their own cards that they have selected and placed face down in front of them at any time. To start the play phase, players pick up the cards they selected during the draft phase. These cards make up each player’s hand during the play phase. 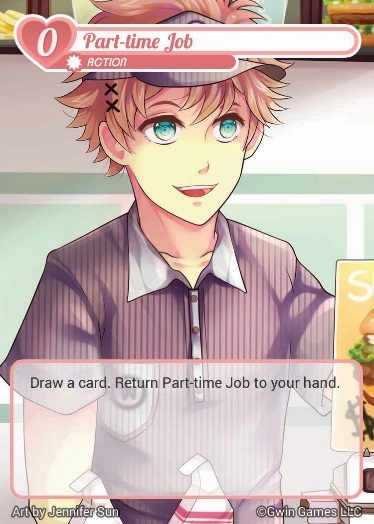 Each player adds a Part-time Job card to their hand. During the play phase, each player also has a field. A player’s field is simply a space in front of them that contains certain cards they or their opponents may play. The cards in a player’s field from the first play phase carry over to the second play phase. Each player selects a card, other than a reaction card, from his or her hand and places it face down to play it. Once all players have selected a card, all players turn their cards face up to reveal them. Each card has a priority value. Cards resolve in priority order – cards with higher priorities resolve first. So a card with priority 4 would resolve prior to a card with priority 3. If there is a tie, use a coin flip or die roll to break the tie. This breaking of ties occurs before any player resolves any cards. A card “resolving” simply means that its effect takes place. See the Card Types section for a description of what happens when each type of card resolves. 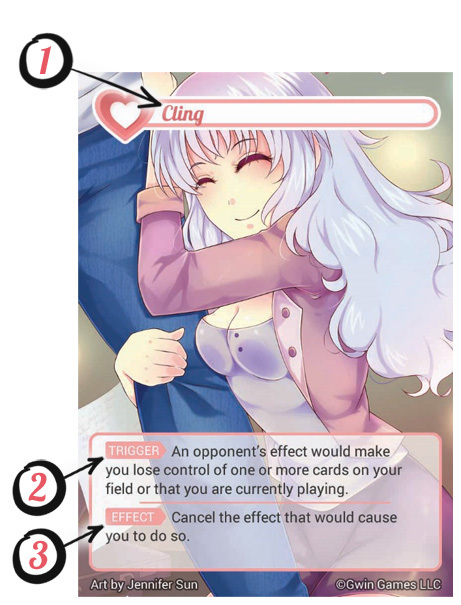 Immediately prior to, or immediately after a player resolves a card, other than a reaction card, that player may move one preparation card on their field to any other valid position on their field. This may only be one once per card resolution. See the Preparation Cards subsection of the Card Types section for an explanation of valid positions. During the play phase, players may also play reaction cards if the trigger condition for a reaction card is met. Players may always play reaction cards if the trigger condition is met. When a reaction card is played, it does not resolve immediately. Other players may play reaction cards that respond to it, or to the same event that the currently pending reaction card is responding to. If such a response occurs, the reaction card played later resolves prior to the reaction card played earlier. If this causes the earlier reaction card to no longer be a valid play, it is simply discarded. 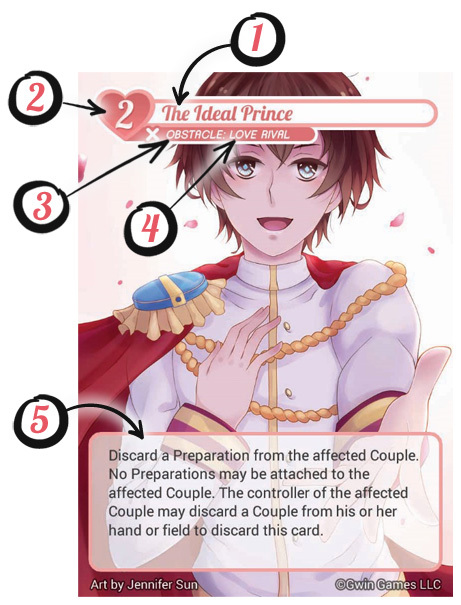 During the play phase, players may also choose to discard any couple or preparation cards in their own field at any time. When the play phase is over, any unused cards in players’ hands are discarded. When an action card resolves, simply perform the effect stated on the card. After the effect has occurred, the card is discarded. When a couple card resolves, its controller simply places it in his or her own field. 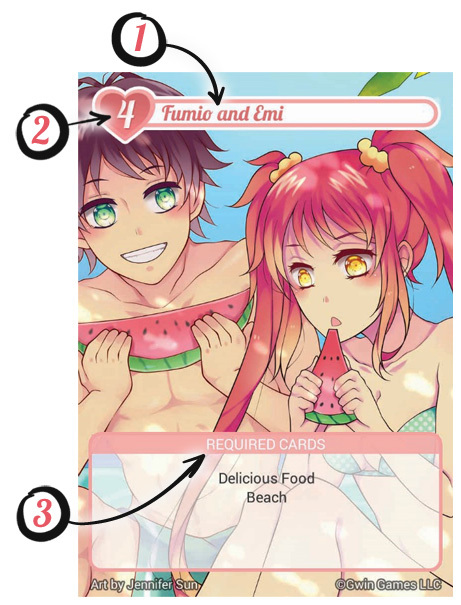 While this card is in a player’s field, one of each of the preparation cards listed in the couple card’s Required Preparation Cards may be attached to it. A couple card with two requirements is worth four victory points at the end of the game if both requirements are attached to it, and a couple card with three requirements is worth nine victory points at the end of the game if all three requirements are attached to it. A couple card is worth one victory point if it does not have all its requirements attached to it. When a preparation card resolves, it must be placed in a valid position in its controller’s field. There are two possible valid positions – attached to a valid couple card, or in a free slot. A valid couple card is any couple card that lists the preparation card as a requirement. Each player also has 3 free slots – one for each type of preparation. So, a player may have one event, one location, and one item in their field and not attached to any couple card. If a preparation card resolves and has no valid position in which to be placed, it is discarded. (Recall, though, that preparations on a player’s field may be discarded at any time, and immediately prior to resolving any non-reaction card one preparation card may be moved within a player’s own field.) Each preparation card is worth one victory point. Reaction cards aren’t played normally. Instead, they can be played immediately whenever their trigger criteria is met. When a reaction card is played, its stated effect takes place, and then the card is discarded. Each preparation card, including ones attached to completed couples, is worth one victory point. Each couple card without a complete set of preparations is worth one victory point. Each couple card with two requirements is worth four victory points if it has both requirements attached. Each couple card with three requirements is worth nine victory points if it has all three requirements attached. If there is a tie, use the following tiebreakers in top down order to decide the winner. The player with the most preparation cards in their field wins. The player with the most couple cards in their field wins. The player with the least number of obstacle cards in their field wins. The player with the most cards in hand wins. If there is still a tie, then the game is a draw. The Part-time Job card may not be discarded. If you do not have any cards in hand except for Part-time Job and are required to discard a card, do nothing. If you do not have any cards in hand except for Part-time Job and are required to make a choice between discarding cards and doing something else, you may not choose to discard a card. If you play a card during play phase 1 that takes effect in or lasts a certain number of turns, the turn count for the card carries over into play phase 2. For example, the card Bullying has an effect that triggers at the start of every turn for 4 turns. If Bullying is played on the 9th turn of play phase 1, its effect will end after it triggers during the 3rd turn of play phase 2.